We have recently published the last issue of the EXARC Journal for this year. You will find it at: http://exarc.net/issue-2012-3. You will see the 'mixed matters' articles as well as a republication of the proceedings of the 1999 workshop on the experimental and educational aspects of bronze metallurgy. 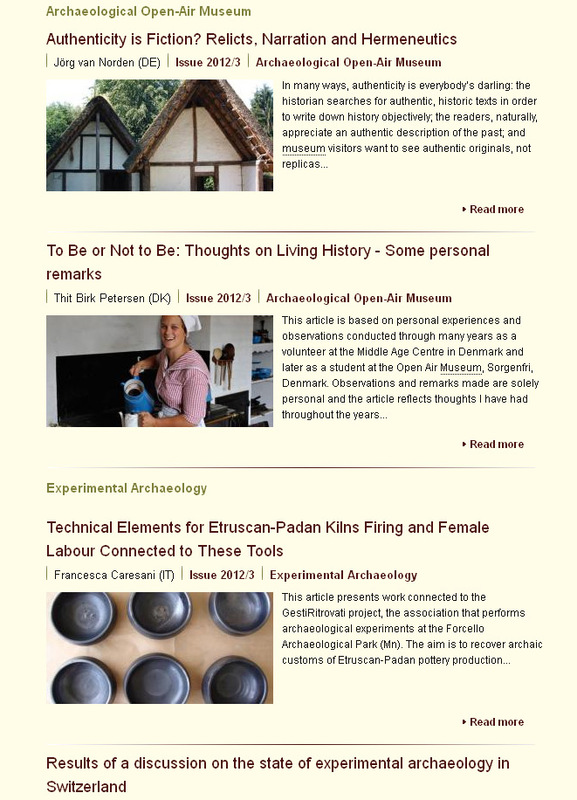 The other articles on experimental archaeology and archaeological open-air museums include reflections on authenticity and living history and experimentation with Etruscan ceramics and the state of experimental archaeology in Switzerland. We will publish in 2012 close to 100 articles on our EXARC Journal and will keep going with that next year. If you have anything to be published, about an event, a book, a museum or experiment, let us know.